Prior to our financial crisis, the overwhelming majority of FHA loans were eventually refinanced into non-FHA loans. The authors of the paper take a loan by loan look at FHA insured mortgaged in LA Country. 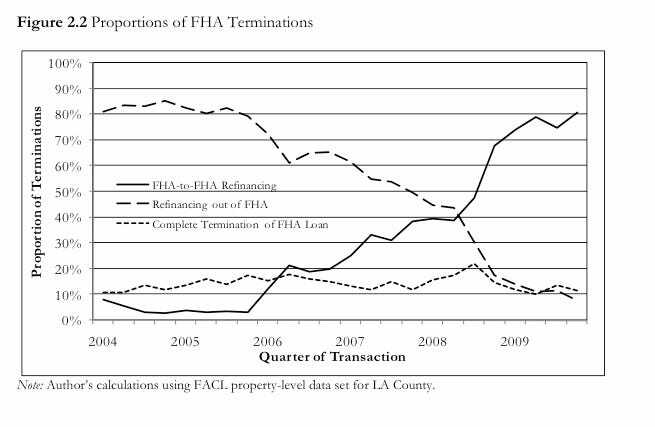 From 2004 to 2006, as many as 80% of loan terminations that the paper studies in LA Country were refinancing into non-FHA supported loans. Basically, people were refinancing to take advantage of better terms available elsewhere or to monetise more of their home equity. 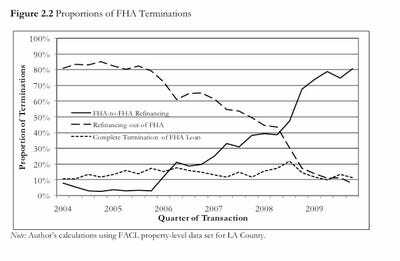 For the FHA, these exit refinancings completely removed the FHA’s exposure to these mortgages. That’s why we’re saying this resembles a Ponzi scheme. The health of the FHA portfolio is now entirely predicated on FHA loans being refinanced into new FHA loans. Nationwide loan-to-loan data is not available. But the authors conclude that a similar pattern of Ponzi FHA-to-FHA refinancing continues on a nationwide scale.